Isn’t it awesome to be part of the millennial generation where the world accepts you as a young mind who make influences even through social media? I mean, they know that us, millennials are spontaneous, carefree, adventorous and innovative (we love to break rules!--- well in a good way). When it comes to our job, they say that we are jumpers, we get bored easily and find new things that can excite us. Read from an article on Facebook that our generation learned the value of living life to the fullest (travelling or doing things that you love while you can) yet are cautious about our future, our spending and our savings. Indeed, we are awesome! Said that this is because we have learned so much from the generation who came before us ---- the generation X. Just like you guys, i’m living the principle of YOLO through travelling and creating impact in my community while I still can but still concerned about my career and hard-earned paycheck. Because yes, we are making money but we’re not gonna do that forever. Someday we will retire or raise our own family. 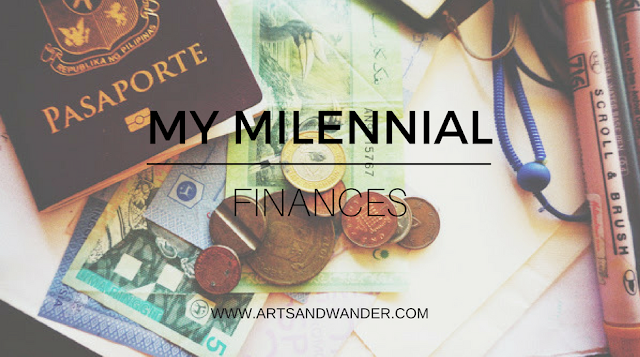 I’m glad to be sharing to you my financial practices that enable me to support myself, provide my share for my family expenses, travel both in the country and abroad and buy things I want randomly. 1. Be a Banker– I have been working for 4 years now, have I saved enough money? No! because, I did not realize the importance of saving money until I thought that I’m turning 30 in just a couple of years. Having a savings bank account will give you the second thought of spending when you receive your salary. It will make you eager to add more money in it because it feels good to see that your money is growing and that it feels so responsibly adulting! Tip: Open only a bank book with no ATM card. For sure, when you are on your money emergency, it’ll be easy for you to withdraw your deposited money instantly through ATM cards. By having a bank book, sometimes, you’ll feel lazy going to your bank. Also, think the idea that the teller already knew you as the “broke – withdrawing kind of a person” whom they’re familiar with because you’re so frequent in their bank withdrawing your money which you just deposited a week or days ago. What a sham! 2. Identity Crisis – No, this is not about you, it’s about your needs vs. wants. Do you actually know the difference?. Needs are your basic necessities like food, shelter and clothing. Wants are the things that are opposite. So before buying anything, identify first whether it's a need or you only want it, through this you can avoid overspending. 3. The 3 day rule – Talking about needs vs. wants, this is also another technique in budgeting. Do you have that guilty pleasure of buying this stuff that you came across the mall while window shopping but not sure if this is a want vs. need kind of a stuff? Have a 3 day rule instead! To avoid impulsive buying, let three days pass before you buy that thing you thought you like. After three days, and you still think about that stuff, it’s ok to buy it knowing that it’s not impulsive anymore. But after three days and you lost your desire of buying, then you’re not impulsive and you even save a money! 4. The Pizza Party – Have you tried eating a whole pizza without slicing? So you think you’d be able to finish it? I think yes but it might leave you bloated. This is the same with our finances, you shouldn’t be eating your whole paycheck for spending and not planning of what to do about it. This is always a famous advice in financial management, divide and save. Get percentage from your salary to which it will all go to your savings/investment or bank account automatically whenever you receive your pay. The remainder will again be divided for your expenses and small treats for yourself. By dividing your finances, you’d be able to address all your financial needs that it won’t leave you broke before your next payday. 5. I’m a commoner – In the U.K. I think, your social status is important before marrying a royalty right? Your lifestyle as a royalty and a commoner is important esp on how you carry yourself and how you live. Same with you financial lifestyle, if you know you’re a commoner, spend like a commoner and don’t social climb beyond your credit limits. This will just cause you so much debts and headaches. So please, stay to your status quo and stop impressing people by your fancy material things. Remember, You Only Live Once (YOLO), and when you die, your fancy proud things will be left here on earth. Don’t spend too much for fancy. The best things in life are free! 6. Be a Royalty – In contrary to a commoner, you can also be a royalty sometime. Don’t just work, save and repeat. That would kill you too! Learn to sometime treat yourself through travelling or buying that thing you’ve been wanting to buy. Plan things up, if you really thought you want that action camera, save money to buy for it and best is wait for a sale instead of impulsive buying through installments. Installments, even if they say that it has less percentage, may cause you to trouble too. What if you have an emergency expense for a month but you’re still paying for an item? That will lead you to danger darling. Treat yourself sometime to break the monotony of work, save and repeat lifestyle. By doing this, you’d be surprise that you are financially capable of buying things without hurting your savings, you’d learn to wait for things that sometimes worth saving money and waiting for. Lastly, you’d be inspired to save more because you learned it and you know you just did it! 7. Mark Zuckerberg – The owner of Facebook took risks and now he just had an empire. I’m not telling you to build another social media platform but be like Mark. He has the spirit to break beyond his box and dared himself to reach his dreams. If you are dreaming to be financially free and capable, dare yourself to invest in mutual funds or business. Yes, it’s good to have a bank account but ideally, it’s better to invest your money to funds or business because it grows a bigger percentage compare to banks that can only give you 0.something %. Ask someone, or even your bank on how they can help you grow your money through business and investments. Bottom-line: Some people might look us down because we are the millennial generation, that sometimes synonymous to negative connotation. However, while we are still young, we have to think about our future and be intelligent in planning it including our finances. By doing this, our generation can be successful. This, contributes to the future of our future children, family and even to the country. Your finances Only Live Oncs! I like how millennials are all about being spontaneous and everything. Though, it is an issue when we're known for the bad things (eg. feeling entitled, not willing to wait, and etc). I know I feel good whenever I deposit $$$$ into my savings account every month. Hey, all of that adds up some day! The 3 day rule sounds really interesting and should be practiced as much as possible. I know I would buy a bunch of cheap things no problem (even though it adds up) but have a long thought whenever it's something on the pricier end. Planning things out is also a good practice. Your future self will thank you! That is true nancy! I love the 3 day rule too!